24(S)-Hydroxycholesterol ELISA Kit from Enzo Life Sciences, Inc.
<b>Figure:</b> 24(S)-Hydroxycholesterol ELISA Kit from Enzo Life Sciences, Inc.
Enzo Life Sciences expands its offering of unique target ELISA products for neurodegenerative disease research with the introduction of the only commercially available 24(S)-Hydroxycholesterol ELISA (24-OHC) kit. This quantitative assay offers a robust alternative to mass spectroscopy for measuring this key marker of cerebral cholesterol metabolism and neurodegeneration. The sensitive 24-OHC competitive ELISA format allows for quantitative detection of 0.78 ng/ml of 24-OHC in various sample types including: tissue culture media, cerebral spinal fluid and tissue homogenate samples. Use this kit for basic research, drug development and high throughput screening when analyzing cerebral cholesterol homeostasis and neurodegenerative disease pathogenesis. The assay offers a user-friendly alternative to mass spectroscopy by using less sample, simplifying sample preparation, and offering high throughput analysis and time savings through the analysis of up to 36 samples in duplicate in just 2 hours. The ELISA is thoroughly validated to ensure excellent reproducibility between experiments, and low cross-reactivity with structurally related molecules such as cholesterol and 22-, 25-, and 27-OHC. Additionally, the ELISA has been shown to detect normal levels of 24-OHC in cerebral spinal fluid and can be used to analyze the inhibition of 24-OHC synthesis. Like all Enzo Life Sciences ELISA kits, the 24-OHC ELISA kit is complete, flexible, and put through rigorous fit-for-purpose validation and stability testing to ensure high precision, accuracy, sensitivity, and specificity. It is supplied with an easy-to-follow protocol, pre-coated microtiter plate and liquid color-coded reagents to save the user time and reduce errors. The 96-well break-apart strip plate design provides throughput flexibility to minimize waste. The 24-OHC ELISA kit is the most recent addition to the Enzo portfolio of products for Alzheimer’s disease, Huntington’s disease, multiple sclerosis and other neurodegenerative disease research. 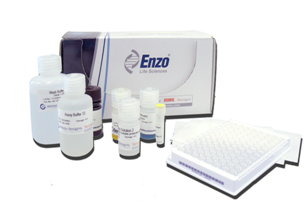 For more information or to order the 24-OHC ELISA Kit or other Enzo Life Sciences products, please visit us at www.enzolifesciences.com or call us at 1-800-942-0430. Enzo Life Sciences, Inc. is a wholly owned subsidiary of Enzo Biochem, Inc. headquartered in Farmingdale, New York. The company is focused on providing innovative life science research reagents worldwide based on nearly 40 years of successful experience in building strong international market recognition, implementing outstanding operational capabilities, and establishing a state-of-the-art electronic information and ordering marketplace. Enzo Life Sciences, Inc. is a recognized leader in labeling and detection technologies across research and diagnostic markets. Our strong portfolio of assay kits, fluorescent dyes, small molecules, antibodies, proteins, peptides, and compound libraries provides life science researchers tools for target identification/validation, drug discovery, high content analysis, gene expression analysis, nucleic acid detection, protein biochemistry and detection, and cellular analysis.